Because of this, its previous 1 system of mirrorless cameras has now been discontinued and its compact line has shrunk to a fraction of its former size. It still very much has a number of solutions for beginners and those with a little more shooting time under their belt, but it's the prospect of one day using one of its more advanced models that entices many. It's the prospect of one day using one of its more advanced models that entices many. The most advanced examples include a healthy assortment of full-frame DSLRs and its most recent Z6 and Z7 full-frame mirrorless cameras, both of which also sport full-frame sensors. 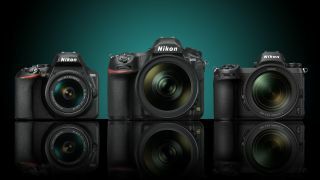 Below this level are high-performing APS-C-based DSLRs that arrives at various price points, with just a scattering of entry-level DSLRs and more junior-level compacts in the remainder of its portfolio. Here's what stands out the most. Nikon’s previous 1 system never really made much of a mark on the mirrorless landscape, but its newer full-frame Z system has got off to a sterling start with the Z6 and Z7 (see below). We reckon the Z6 is hard to beat for the price, offering a great blend of features and performance that should keep both pros and enthusiasts happy. The 24.5MP full-frame sensor is capable of delivering excellent results, while the 273-point AF system (while not quite as sophisticated as the 693-point AF in the Sony A7 III) and 12fps burst shooting should mean you'll never miss another shot. Handling is polished too, while the large and bright electronic viewfinder is a joy to use. Excellent. Much like the company’s D850 DSLR (below), the Z7's ace card is that it manages to blend a high-resolution sensor with fast burst shooting and a fleshed-out 4K video recording option, making it versatile enough to be used for all kinds of applications. Key advantages over its D850 cousin include 493 phase-detect AF points that stretch right across 90% of the vertical and horizontal axes, together with 5-axis Vibration Reduction that can be used with all kinds of lenses. As we found in our review, handling is great and the 3.69-million dot viewfinder is a joy to use, while video quality is also very strong. The company’s most junior DSLR blends a capable imaging core with a light body and a fuss-free interface, and delivers it all with modest price tag. While we don’t expect many extras at this level, we’re lucky enough to get a handful, including a 1,550-shot battery life that is significantly better than every other camera in its class. Compatibility with decades' worth of F-mount lenses and a 24.2MP sensor that loses its anti-aliasing filter to better capture fine details sweeten the deal further, although the lack of built-in sensor cleaning is a shame. The fact that there's no touchscreen may also displease those used to jabbing away at their phones and tablets, although on such an affordable model, it’s easy to understand Nikon’s decision to go without this. The lack of a touchscreen does show its age somewhat, although this was also omitted from the P1000 and it's arguably less of a priority on a camera likely of this sort. It’s a shame there’s no Raw capture too, but full manual control over exposure does at least give you the flexibility to get it right in camera for ready-to-use results.